Your request for a Certificate of Insurance has been received. We will begin processing your request immediately. Most requests are completed the same business day. If a request is placed after business hours, we will process it the following business day. Once ready, your certificate will be emailed to the email address provided on your initial request. The email will be sent from support@rvnuccio.com. What if I need a Certificate after business hours? 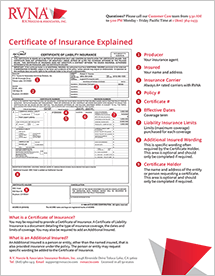 RV Nuccio offers instant Certificates of Liability Insurance online through our RVNA policy management system. Simply sign in to your account using your email address and password. Select your policy and choose Add Additional Insured. Our online system will add your Additional Insured instantly. You can print or email the Certificate immediately. Need help understanding your Certificate? View RVNA's Certificate of Liability Explained.